This house was built by Millard Fairlamb of Delta, Colorado in 1906. It was the first house in the area built by workers on an "eight-hour-work day". The house was built of Delta Brick from the Delta Brick and Tile Company. It is of classic Four Square architectural style construction with post Victorian Arts & Crafts design elements. Previous owners of the house include Millard and Stella Fairlamb, Charles and Ethel Fairlamb, and Harley and Ethel (Lale) Fairlamb Jackson. It was owned by members of the Fairlamb family for approximately seventy-two years. After 1978 it has had two different owners and numerous renters. Doctors Pflum and VanAtta owned the house respectively. John Taylor and Elizabeth Thompson purchased the house in February, 1994, and began a "facelift" to renovate the interior and exterior while maintaining the underlying style and flavor of this post-Victorian era home. An Arts and Crafts decorative style complements the four-square architectural form. The Fairlamb House is on the Colorado register of historic properties and on the Delta historic register. The sixteen years before 1994 when Elizabeth and John purchased the house had taken a toll on the property. Several years during that time the house had sat vacant or had short term renters. Elizabeth and John have done extensive renovation and refurbishing to the interior of the house as well as to the surrounding grounds. Additional decorating and future landscaping is planned including replacement of the wraparound porch that was removed in the mid 1960's. A gazebo and wandering paths are part of the future master plan for the gardens in the rear of the house. Some of this work has already begun. The front door and entryway door are original. (Notice the beveled glass.) The entryway and the foyer both have original inlaid floors utilizing two different patterns and a combination of four different hardwoods. The light fixtures are not original to the house. 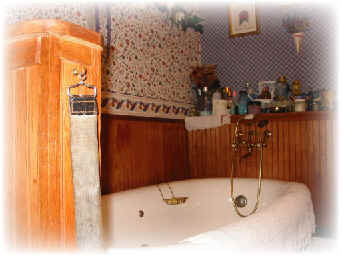 In fact, none of the furnishings in the house are original to the Fairlambs except the built-in items, and the soap dish on the tub in the large bath on the 2nd floor. The soap dish was a gift to us from Sky Fairlamb, who found the item at an auction. 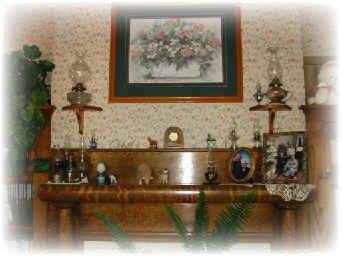 The entryway and hallway light fixtures were salvaged by Elizabeth's father from an old school building located in central Washington State which was demolished in 1962. The foyer fixture is an Arts and Crafts design of stained glass and brass. It was salvaged from a business in downtown Denver and given to John and Elizabeth by a friend. 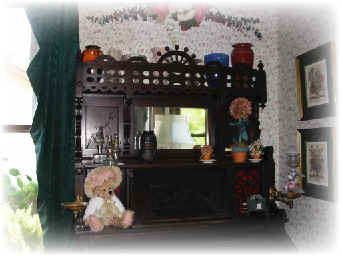 The grandfather clock was built for Elizabeth by her father especially for this house. 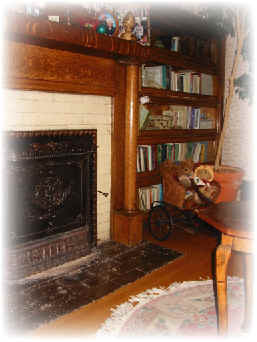 A pellet stove was added into the existing fireplace with the original being preserved behind the metal surround.